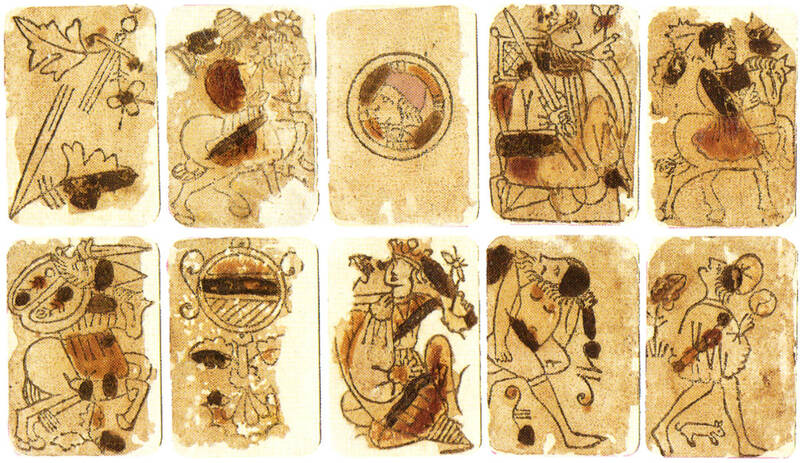 Above: fifteen cards from a primitive Latin suited pack, possibly of Swiss or German origin for export to Spain, dated by paper analysis as early XV century, which makes this one of the earliest known surviving packs of playing cards. There are Moorish influences in some of the cards: see the double-panelled Saracenic shield on the cavalier of swords (bottom row). The cards show lingering evidence of a suit system derived from early Arabic cards, which in turn became popular throughout Europe from the 15th century. They have been printed from wood blocks and coloured by a technique known as 'a la morisca' which involved using the fingers dipped into the pigment. This is different from other early packs of cards which were hand-painted or illuminated and therefore more expensive. As their popularity spread, new methods of production were discovered to produce packs of playing cards more cheaply. Cards in the Museo "Fournier" de Naipes de Alava. Images on this page of cards in the Museo "Fournier" de Naipes de Alava (Diputación Foral de Alava, Cuchillería 54, 01001 Vitoria-Gasteiz, Spain) are taken from Agudo Ruiz (2000) and Suarez Alba (1991). Used with permission.